IÃ¢â‚¬â„¢ll huff, and IÃ¢â‚¬â„¢ll puff, and IÃ¢â‚¬â„¢ll blow your house in. No, IÃ¢â‚¬â„¢m not talking about the Three Little Pigs. The Federal Alliance for Safe Homes (FLASH) is launching StormStruckÃ‚ ®, a new 3D animated app from the USA Science and Engineering Festival in Washington, DC today. This new app allows users to create an intense windstorm with a simple swipe of a finger and see in 3D the kind of damage it can do to an average home. Users then choose from a variety of upgrades that protect the home and enable it to withstand damage. Everything from garage doors to roof connections can change the fate of the home and increase its chance of survival. 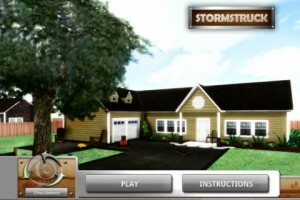 The aptly-named StormStruck app is free and compatible with the iPhone, iPad and iPod touch. It is available now for download in theÃ‚ iTunes App Store. Once you’ve seen how severe weather has the potential to damage your house, you might want to make a home inventory of your personal possessions. The good news is that the Insurance Information Institute (I.I.I.) has a new home inventory app for iPhone to make the process even easier. The I.I.I.Ã¢â‚¬â„¢s Know Your StuffÃ‚ ® – Home Inventory is Web-based software that can be found at KnowYourStuff.org. If you have an iPhone, you can also download theÃ‚ free Know Your StuffÃ‚ ® – Home Inventory app in the iTunes App Store.